We're sure lots of you out there already know how to make those curled ribbon hair bows, but we thought we'd put a princess spin on it. Perfect for a fairy party or dress up. Step One: Drill a small hole in one end of a 12" dowel. With the remaining dowels, use a clothespin to clip one end of ribbon to the end. Tightly wrap the ribbon around the dowel and use another clothespin pin it in place. Wrap all of your dowels with your ribbon. Step Two: Place on a cookie sheet and bake in your oven for 20 minutes at 275 degrees. Step Three: While your ribbons are baking, paint the dowel with the hole in it with glitter paint. We like Plaid's Folk Art Extreme Glitter. It's a transparent paint full of fine glitter that gives your project a little sugar. We painted it directly on the wood, but you could also paint your dowel with an acrylic paint and then finish it off with a layer or two of Extreme Glitter on top. Step Four: Slowly unwrap the ribbon and cut to your desired length. Apply Fray Check or similar product to ribbon ends to prevent fraying. You can also heat set them with a heat gun or a flame (be careful not to burn yourself or start your ribbon on fire though!). Step Five: Lay the ribbons out evenly and use a clip (I used a large salon clip from the beauty supply store) to hold them all in place. Take another thin piece of ribbon or string and tie all the pieces together. Double knot it. Step Six: Run a piece of wire through the hole in your painted dowel. Then run the wire under and around the thin ribbon you used to hold the spirals together. Wrap the ends of the wire around the dowel so it will not move. If you want, you can also use glitter spray to spray the ribbons to make it even more dazzling. That's it! Magical, isn't it? So cute! Thank you for sharing! Now....if only I had a girl! LOL! I have a quick question... do you need to wet the ribbons with water or starch before wrapping them on the dowel? That is so awesome. I'd have never thought to bake the ribbon to keep the curl. Very clever. My little girl hasn't got to the "princess" dressing up age yet - but with this project, I'll be ready when she does! What a GREAT idea!! We are going to a birthday party for a sweet little one next weekend, I think this may just be part of her present!! Love this! I'll be trying to make some of these this weekend. Thank you for posting this. They will be super cute in the fairy portraits that I'm doing on the 11th. No need to spray the ribbon with starch or water. I just wrapped it up without anything and it works just fine. My daughter's birthday is coming up next month and she'll love this wand combined with a felt birthday crown - thanks for the instructions and the fabulous timing! Big fans of the curly ribbon bows -- never thought of doing that for a wand. Adorable. Love it. Thank you so much. I saw them before but had no idea how to make them and now I do. My big girl doesn't play anymore, but it will be nice to use on bags or else! What a great idea. I know many little girls love these. My girls would love that! I need to make these with my baby girl. Aww, how fun! What great favors. I'll be linking. 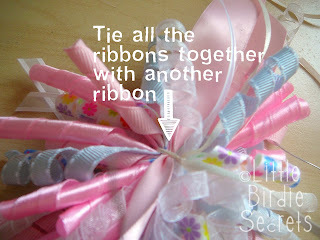 Make sure you use different sizes of ribbons. I just used small width ribbons and I'm starting to wish I had used some wider ones. One suggestion I have in regards to curling the ribbons is to cover the dowels with tinfoil. The first time I did it the sap oozed out of the wood with the heat of the oven and soaked into the ribbon. The house smelled lovely, like a pine forest on a hot day, but some of the ribbon was ruined! Only some dowels did this, but the foil around all of them meant I didn't have to worry about it again. They are so cute and nice. I made wands for my little gires b-day but ther not as nice. I also made fairy tiaras. They came out grate. um question about the oven temp, is this celcius or farenheit, cos there is big difference. I was worried about burning up the ribbons. We are also trying to save money at the moment so I used my wooden spoon handles instead of buying dowels. Thank you so much for a fantastic tutorial, I tried it out this week and it worked brilliantly. I now have streamers of ribbon on my card! !Love Jacky x! These are the nicest wands I've seen and want to make some! What kind of drill and size of bit did you use? I'm wondering if I need to borrow a drill from someone...thanks!! is there a particular ribbon i need to use? ie, material to look for? We made these at my daughter's fairy party today. It was a big hit! Much preferred over the cardboard fairy wands! party poppers tutorial - 4th of july fun!